Just one of many wonderful old albumen photographs in four large, heavy albums of original photographs by Fratelli Alinari, the world’s oldest photography firm, founded in Florence in 1852. In the beginning the company, started by two brothers, focused on documenting Italian paintings, sculpture and architecture – they had the idea of photographically reproducing every major Italian work of art. It wasn’t long before their reputation was established among art collectors and historians. In recent years, some of their images have become particularly valuable as certain of the works they photographed have been lost to time or the ravages of World War II. 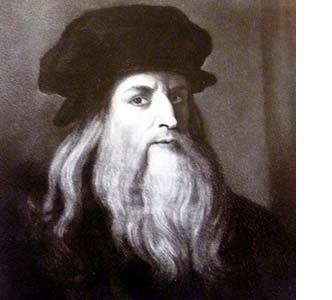 The photographs date from around 1860-1870 – this one is of a painting by Leonardo da Vinci.